Word(less) Wednesday: What Do We Want (More)? 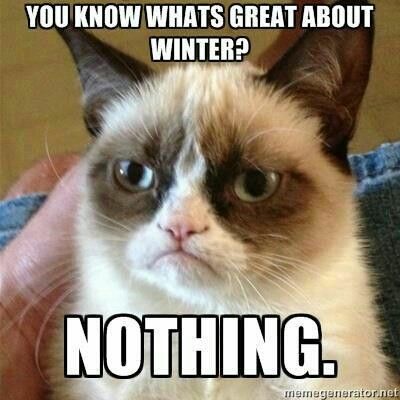 #HolyNoWriteNovember... is it Thanksgiving yet? Meeting and hanging out with Baby Simone! 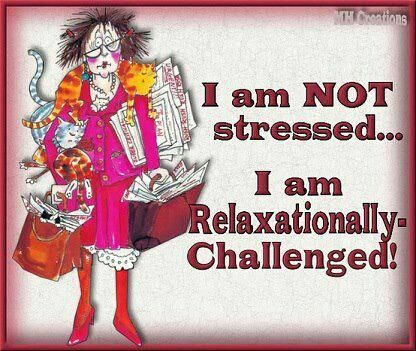 Am I turning into a frazzled bag lady? Busy, busy, busy! Celebrating, working, traveling, more work, events. That's what I've been up to the past few weeks, and desperately have missed writing blog posts consistently! Through thick and thin. 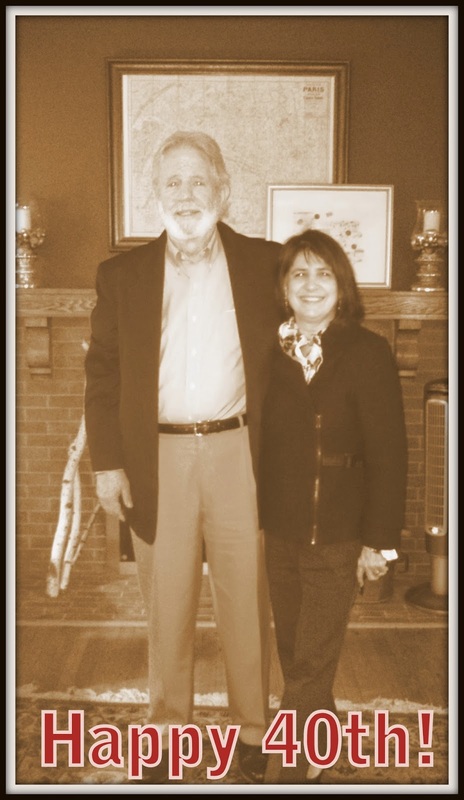 sickness and health, joy and despair, darkness and light--this couple has truly emerged as an extraordinary example of standing beside each other and committed partnership. As I've gotten older, I have seen their relationship grow stronger and more positive and more playful. but rarely can we snap a good picture of him smiling! We celebrated the big occasion as a family at one of my personal favorite date restaurants, Nighttown :) which, rightfully so, has been opened for over 40 years in CLE! I had the Eggs Benedict, which never disappoints! Check out their Sunday brunch menu here. 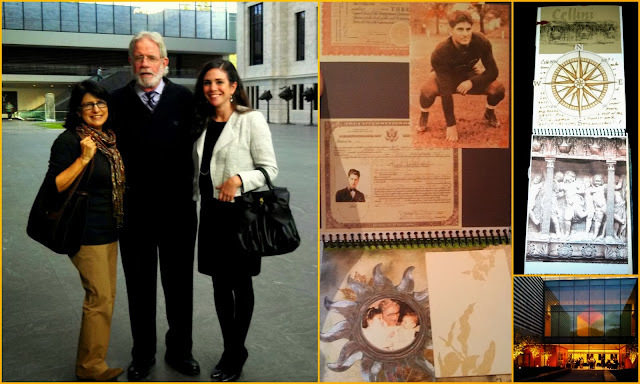 We laughed, ate, and listened as my parents recounted some anniversaries past--oh the stories!! 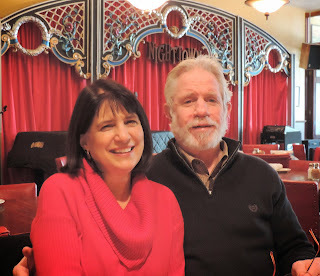 Here's to wishing them another 40 years together, and each one better than the last! So proud of you, kids! 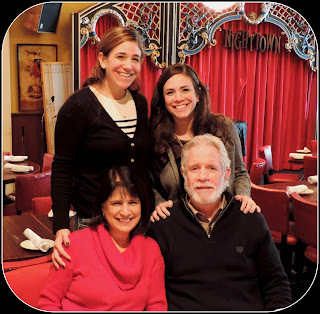 And feel truly blessed to have a wonderful family that sticks together and supports each other. 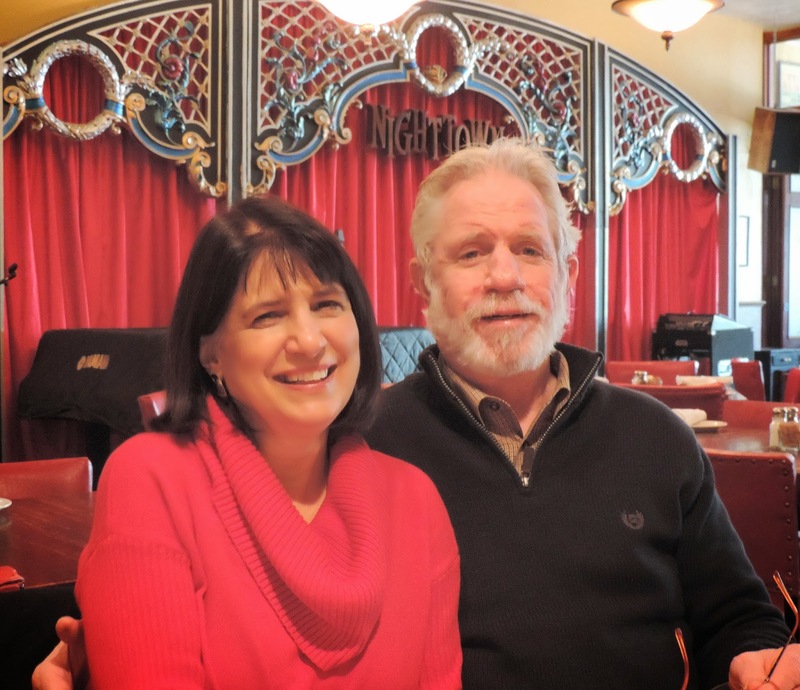 I hope one day I'll be celebrating my 40th wedding anniversary too. Lots of love! So proud of you, Mom! 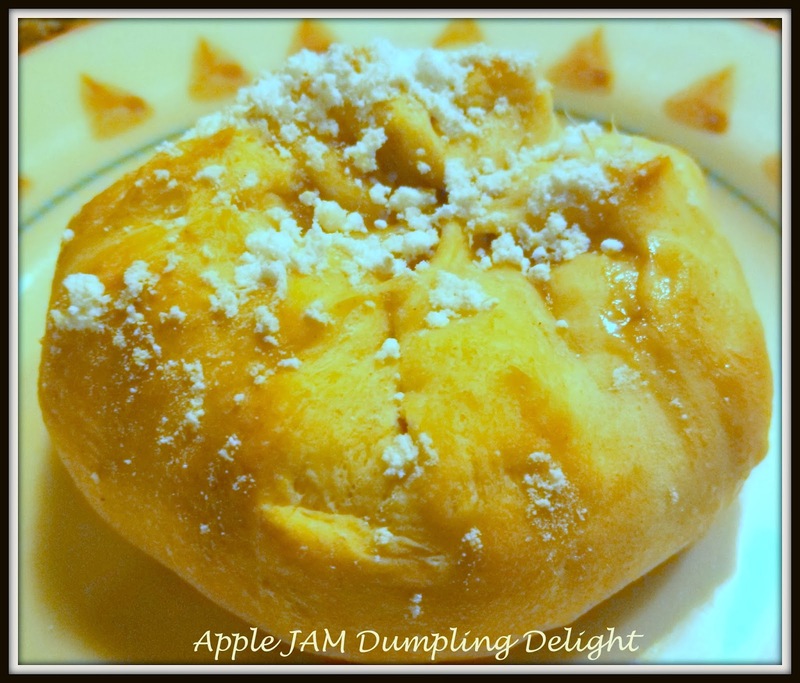 Fall Baking: Apple JAM Dumpling Delights! There are so many fall foods that I love that it's tough to choose a fave! From butternut squash, pumpkin pie, hearty chilli to fresh apples--the seasonal change shifts us from outside to inside, and into a cozy kitchen wafting with delicious aromas! 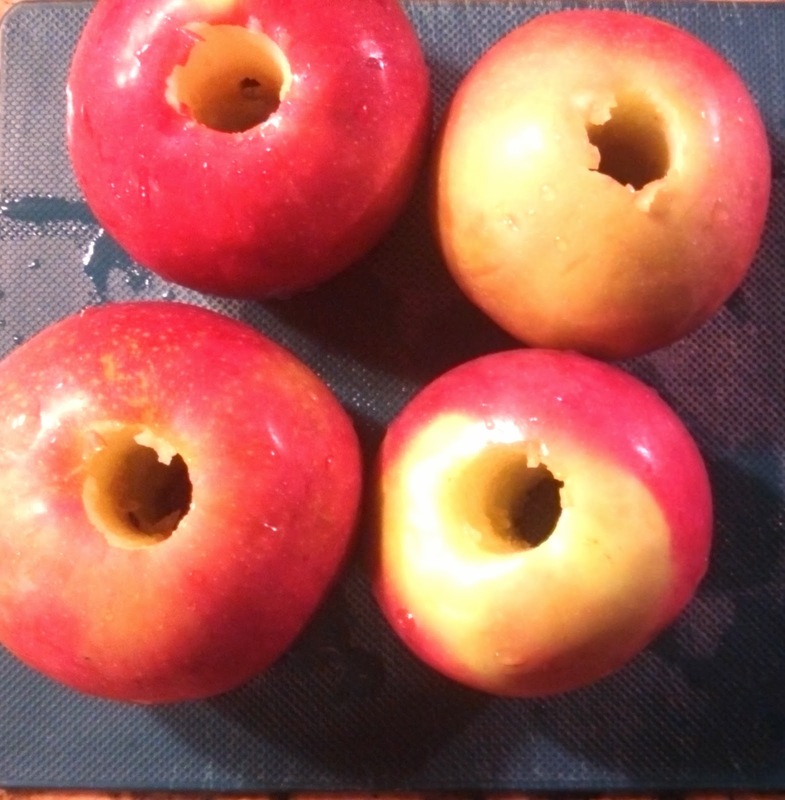 On Sunday night, as the rain rolled in, I decided to try my creative hand in the kitchen with a huge bag of red McIntosh apples that we had. 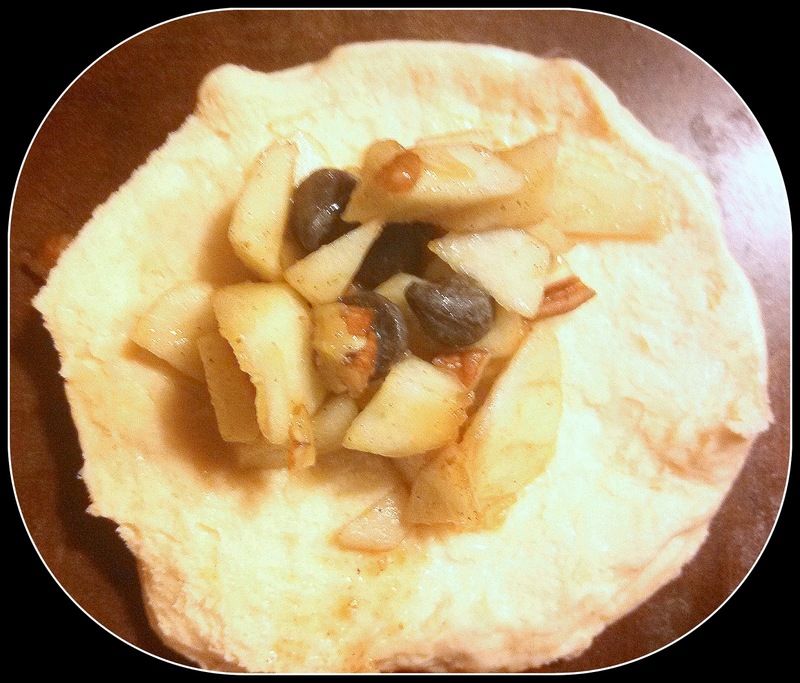 I modified a recipe I found on Pinterest originally from Cooking with Chopin Blog. Pre-heat the over to 350. Crank it up! Add brown sugar and cinnamon to the medium size bowl. Time to get nutty. Chop up pecans to produce 1/2 cup and add to the bowl. Wash the apples, core, and peel. Chop into small chunks. If you're worried about your apples browning, just squeeze a little lemon juice on them. Boom. 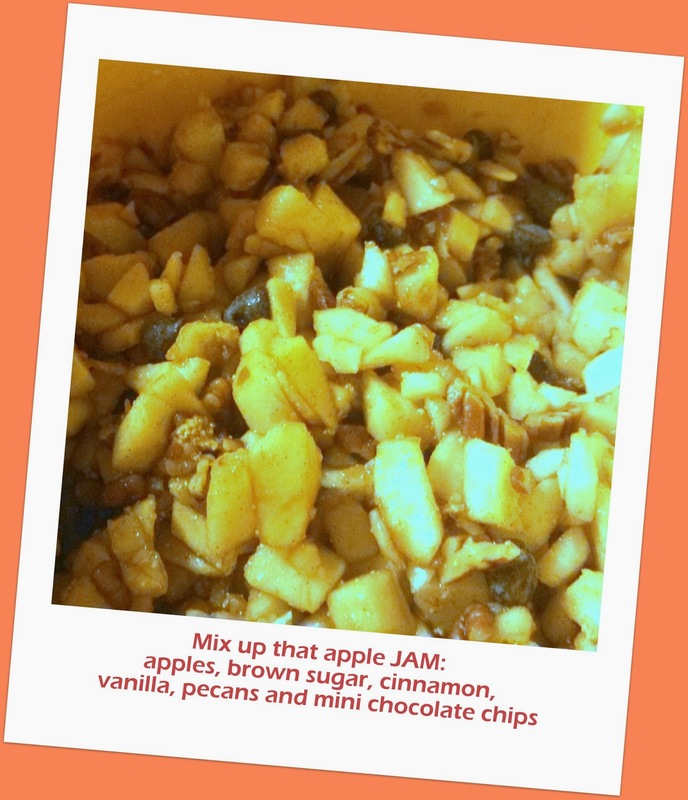 Add the apple bits to the brown sugar, cinnamon, and pecan mixture. Stir it up until the apples are coated generously. Finish with the vanilla and chocolate chips. You can always add in more to your liking :) Stir again. Take your can of biscuits, bust it open, and divide (most cans serve 8, peel dough apart into 2 or more). Lay out dough onto baking sheets about a 1/2 inch apart. You don't need to grease the sheet. Pinch into a dumping shape by taking the edges of the dough up to the center and close. (Try to press the edges of the dough together since they will expand a bit in the oven.) I made some mini and some regular size dumplings. Pop these bad boys into the oven for 12-14 minutes. And await for the scrumptious smell of fall to bake into the house. 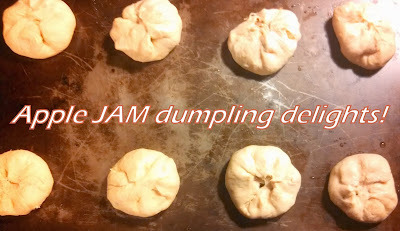 When the dumplings expand a bit in the oven, the apple JAM mixture will bubble and caramelize the top edges a bit. To.die.for! 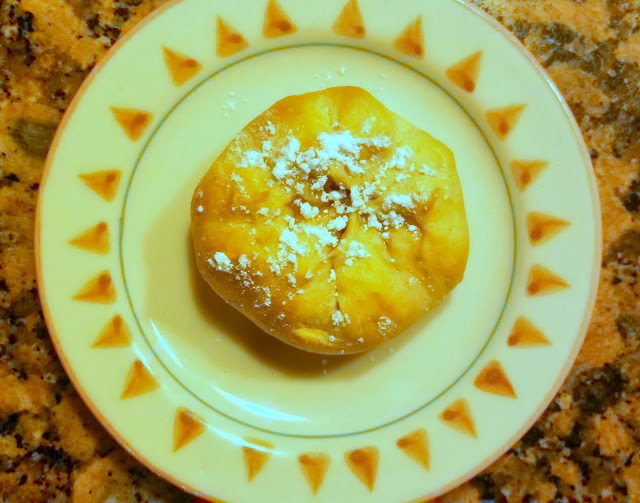 Sprinkle on a bit of powdered sugar on your Apple JAM Dumpling Delights while still warm. Take a big ol' bite, get a taste of fall, and praise the heavens!!! Easy, fast and fall baking basics! Yum!!! What's your favorite fall dessert or dish? Share your thoughts or recipes! Last evening I attended the Morgan Conservatory Annual Benefit and Silent Auction: Opposites Attract. My mom had a piece in the silent auction and I was so excited to show my support and check out all of the awesome artwork and paper! The month of October is dedicated to celebrating the paper arts, so check out all the other events going on in Cleveland during Octavofest 2013. 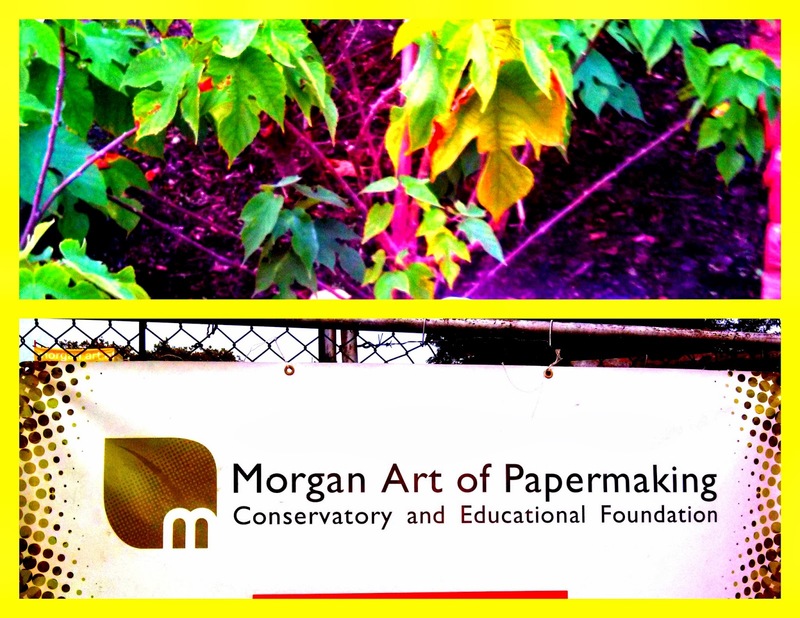 "The Morgan Art of Papermaking Conservatory and Educational Foundation is a Cleveland, Ohio non-profit art center dedicated to the production and preservation of hand papermaking and the art of the book." 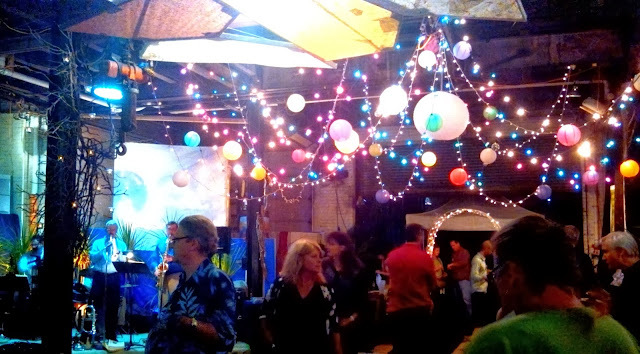 This is their big fundraiser and the whole warehouse/gallery turns into a magical creative space--complete with live music, hand-crafted decorations, food and drink, demos and fab art for a good cause! As soon as you stepped into the space you could feel the creative and magnetic energy, after all, the benefit this year was rightfully named, Opposites Attract. The Morgan Conservatory really embodies the idea of opposites attract. The ominous and rust-belt looking warehouse holds tremendous beauty, revitalization and creative production inside. The shell of the building on E.47th St may look a bit intimidating, but the lush Japanese mulberry trees in the back of the premises serve as the source for the hand papermaking production. Yes, they actually harvest the plant fibers and make their own paper. SO TOTALLY COOL! 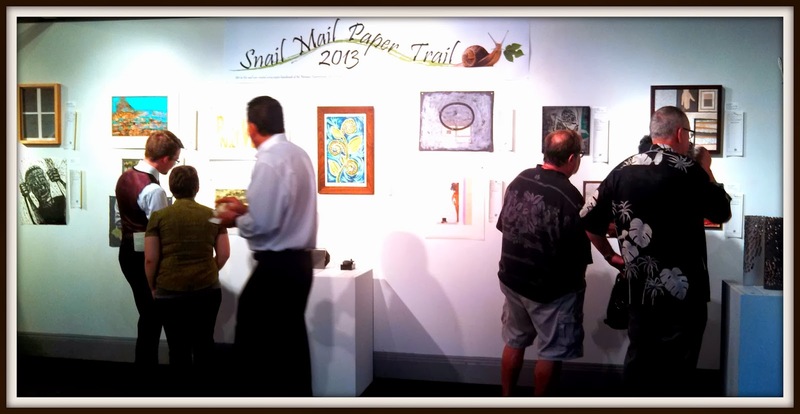 During the event you could check out all of the different types of paper that members and artists had created or used in their collection. 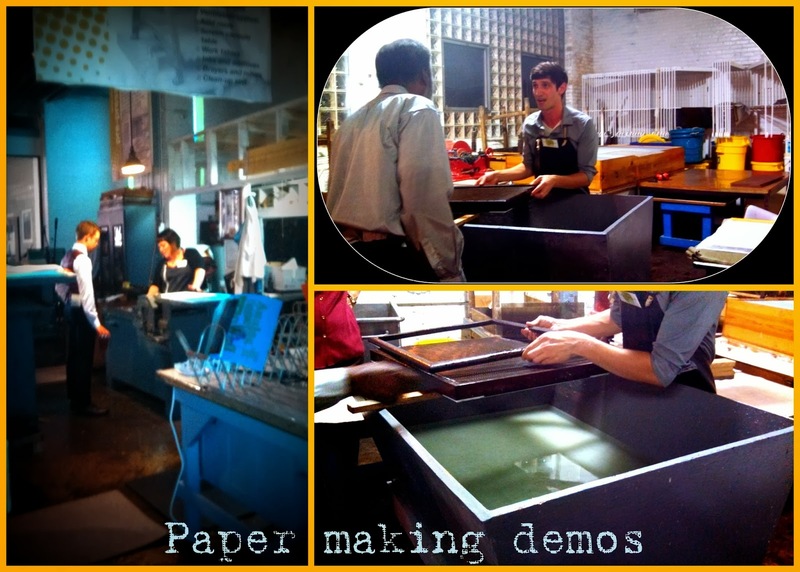 They even had staff at different stations doing demos to show the step-by-step process of the labor-intensive art of paper making. 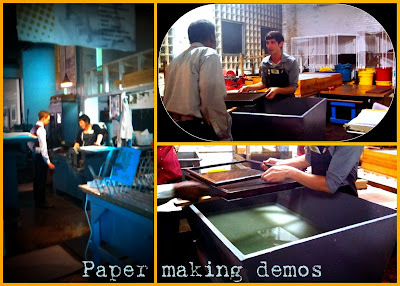 We made our rounds checking out all of the ways in which artists used paper. From handmade books, installations, to intricately cut paper, and typography--there were so many different ways people used the paper. And the silent auction allowed you to bid on well-known artists and cool pieces for relatively low prices. Hope I get a call on one of my bids :) The best part is that all of the artists donated their work to raise money to benefit the Morgan and support educational workshops. So be sure to check out the month long celebration of paper arts in Cleveland! I'll be back at the Morgan next weekend for the Abecedarium and revisit my ABC's. 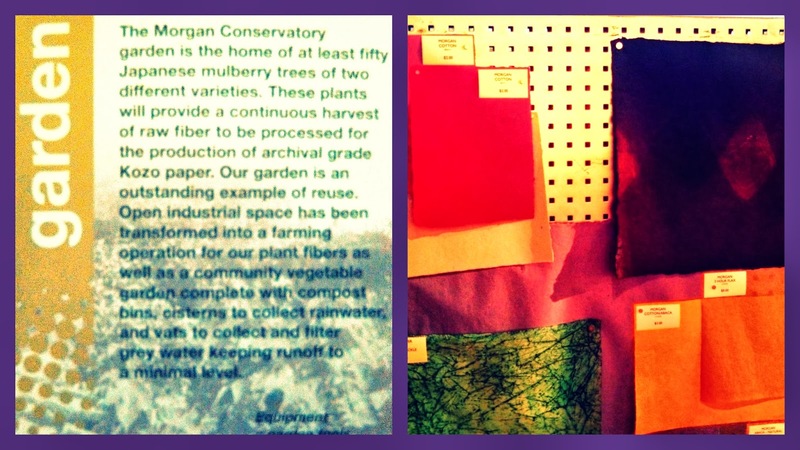 Visit Morgan Conservatory to learn about the process of hand-making paper or other events around town that are part of Octavofest. 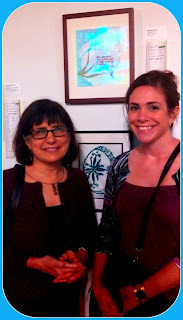 Disclosure: My mom is a member of Morgan Conservatory and participating artist in Octavofest. All opinions are entirely my own. And I think she's awesome. Do you ever need a different view of CLE? 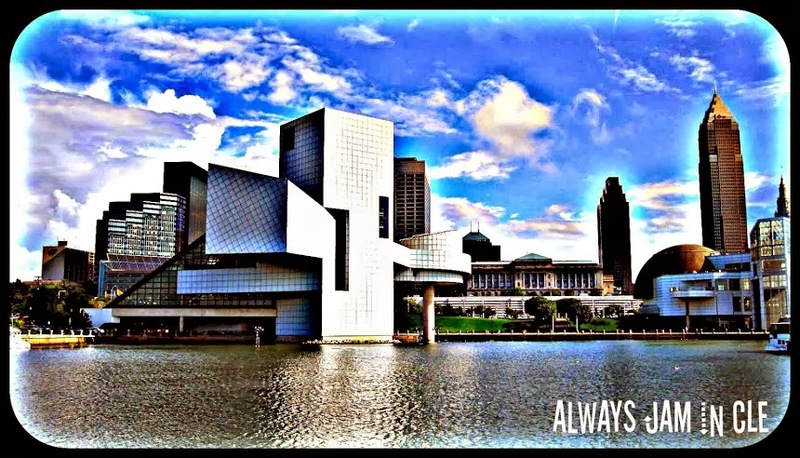 Whether you're a born and raised Clevelander and think you've seen it all, or are stuck in the monotony of your daily commute--there always seems to be a new and different view of CLE, if we pause for reflection and change our standpoint, ever so slightly! 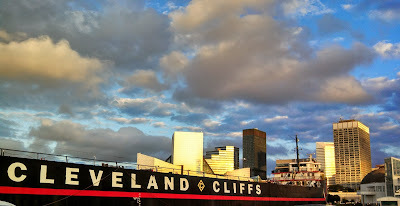 My new view came from the age-old Port of Cleveland! Last weekend, post-Ingenuity Fest, I snapped these spectacular photos with blustery autumn skies and a slanted sunset. What a totally unbelievable view of the infamous skyline from the Port as opposed to my daily view from the Shoreway. I love the clean and modern lines of the Rock Hall and Science Center against the reflection of times past and the old steamship, William G. Mather. It was almost disorienting to take in this angle of the city and our iconic buildings and landmarks. Growing up with the lake serving as my eternal compass, the city looks entirely different when my point of reference is out of sight. Look at those looming clouds against that shiny steel! What new view or perspective have you recently seen of the city? What's your favorite vantage point of the cityscape? How do you change up your daily routine to see the city with fresh eyes? If you're a newbie gardener, you can check out the plant finder tool on Petitti's website that allows you to narrow your search according to season, height, light needs and more. 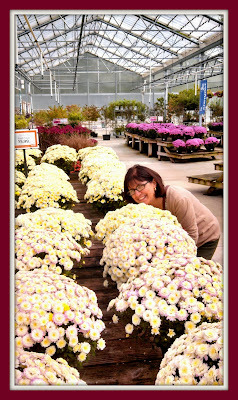 You can come prepared, or stroll through the greenhouse to find a flower or plant that jumps out at you! 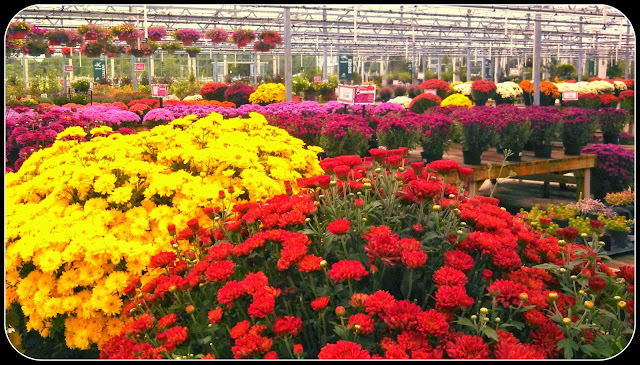 Like these rows and rows of fall mums! Look at all those pretty colors--these are some of my faves! 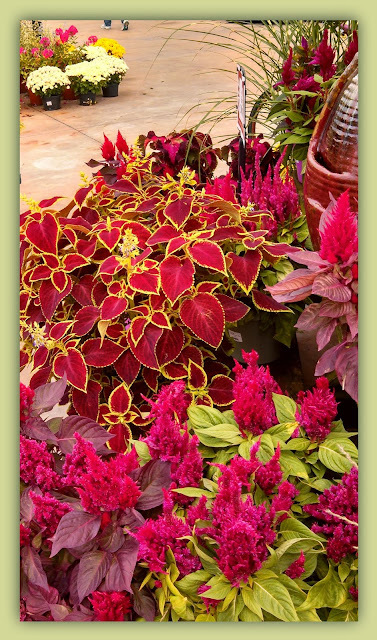 I love the deep purple and fuchsia colors for fall, like the leafy Coleus. 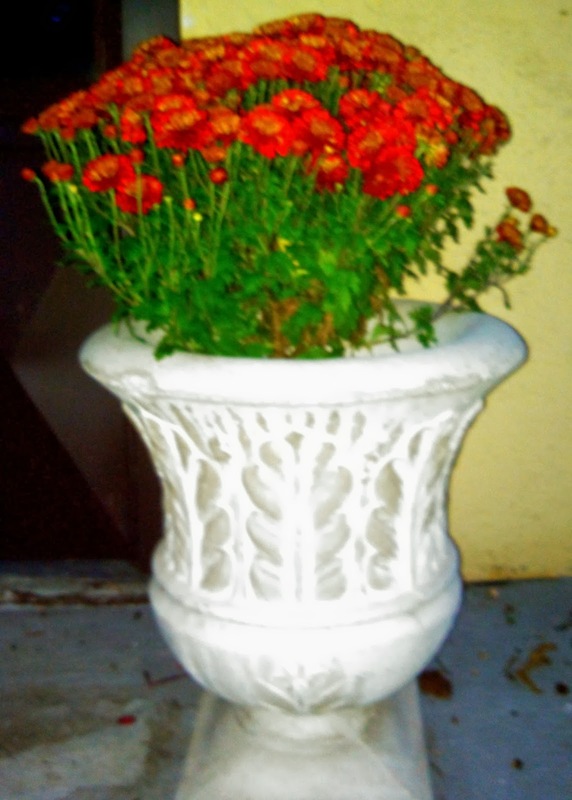 Finally, I ended up choosing two of these pretty rust colored mums for the planters. I can't wait to get some local pumpkins to add in the weeks ahead too! 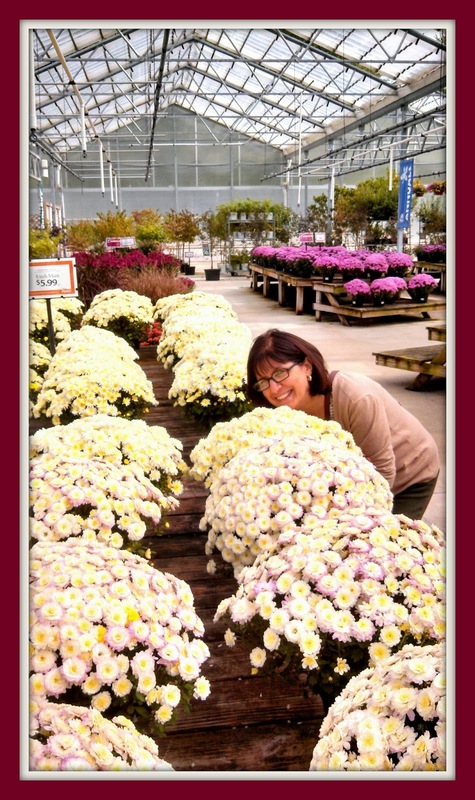 So if you're looking for a fun way to spend a fall afternoon, I'd highly recommend a trip to Petitti's to get your fall flowers! What's your favorite fall flower? 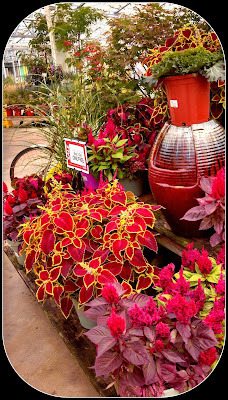 What fall gardening tips/recommendations do you have for your fellow Clevelanders? Share your thoughts! Hi! 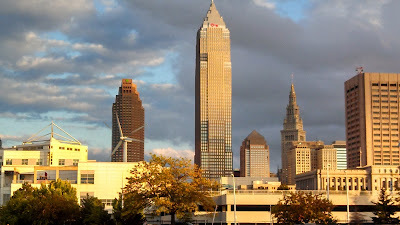 I am JAM and this blog was created to promote and inspire others to piece together the positive people, places, and personal stories into the bigger picture that makes up our great land of CLE. Me? I'm always JAMmin' in CLE! Market at the Food Bank ~ Giveaway! Happy New Year! Let’s make sure you rock 2016! Why? Silver Spoon Awards Party Giveaway! The Coolest, Most Creative, Caring 17 Year Old Cleveland/Canadian Designer!